Lose That Girl: RATE IT! Mad Men Yourself! An afternoon that was meant to be spent doing some freelance writing has turned into a "Mad Men" character creation-a-thon! 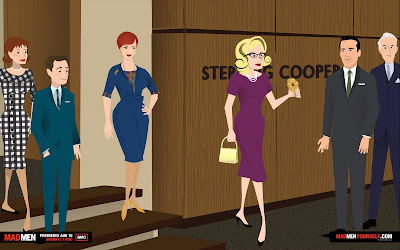 Have you seen this neato section of AMC's "Mad Men" site? You can 'Mad Men Yourself' -- it's really easy and a complete hoot! Click here and lose track of your afternoon. Labels: Mad Men, Television, Why Not? LOVE IT! Love yours - I can totally see that! Mine was very similar, except for a martini instead of donut (it was a tough call).